--- YES you can! In fact, with the help of a generator, you can go 100% mobile. These steam systems are all electric, full commercial & industrial grade and require no fuel. All you need is a power source be it a wall outlet or a generator. Our 120V version works on a standard household outlet. Same kind you find all over your home if you are in the US. NOTE: If you are going to use the Vapor Rino WITHOUT a vacuum or WITHOUT ANY other devices you may work with smaller generator sizes. MINIMUM sizes with NOTHING Else plugged in are as follows. 120V used alone can run on a 4,000-running watt generator. Bigger is always better. The 230Volt Rino can be run on as little as a 5000-running watt generator. Bigger is better. NOTE: “Running watts” are not the same as “Peek” or “Surge wattage”. Many generators are advertised with their surge power capacity shown in big numbers on the box. These surge powers are only sustainable for very short bursts. You want to know what the actual nonstop RUNNING watts are. The running watts are always lower than the peek surge watts. When buying a generator, you might see the box say something like "8000 Watts with 6000 Watts running power". Always look for the lower running / continuous wattage output number. Do not accept the first number you read when buying a generator. Read closer. Running any electronic device on an under powered generator will damage the circuitry! Get the right generator and you are good to go. When picking a generator for our 230V system (ignore the following if you are getting a 120V steamer) we recommend getting one that has the 240-volt outlet in the form of a 4-prong twist lock. This outlet number type is a NEMA “L14-30”. There is an adaptor available on Amazon that works great with the Vapor Rino. This plug takes the 4 prong L14-30 and reduces it down to a 3 prong 6-20/15R. These 6-15 three prong adaptors match the plug on the 230V Vapor Rino. If you are buying a 120V system, you can ignore this information. You can find a link to the Amazon page on the specifications tab on the 230V Vapor Rino page. Why these “high” running watts? Several reasons. Fist, this gives you some room for error and offers more protection to your steam cleaner investment. Example: If you had a 2000 W generator running an 1800W machine that generator would be running at almost 100% capacity all the time. The generator will run hard and hot, make more noise, wear out much faster and risk sending electrical spikes and surges into your new commercial steam cleaner. This may damage the system electronics. This kind of DAMAGE can be repaired but it IS NOT UNDER WARANTY. Also, if someone unknowingly plugs something else into your generator the higher wattage gives you a safety margin protecting both your machines and your generator. Remember, an over taxed generator WILL burn out fast and damage electronics. Our warranty does not cover damage created by a generator or improper use. Always use appropriate, well tested power source. This is not a corner to cut. Can I Get a 230V Steam Cleaner? Yes, on some systems like our 145psi Vapor Rino. See our products page for more info. Our 230V versions are amazing boasting recovery times of as little as 20 to 30 seconds. They hold around 90 PSI during extended nonstop use and bounce back to 145 PSI very quickly! More steam = more power = faster cleaning times. We now have a converter that gives you INSTANT 230 Volts from two household outlets. See menu for converter. What is the PSI or BARS of pressure it produces? 1) PSI: Stands for POUNDS PER SQUARE INCH, its a measurement of pressure. 2) BARS: Is the European systems to measure pressure. Each BAR is = to 14.5 PSI. Example, 10 Bars = 145 PSI. We offer various units for sale. Our large VR145 Vapor Rino commercial vapor steam cleaner produces 145 PSI (10 bars) Maximum pressure. America's most powerful 120Volt all electric, chemical injected vapor steam cleaner as of 2015! We have other systems that are 5.5 bars or 80 PSI. Check individual product pages for specific specifications for each product or give us a call! What does GPH or GPM mean? * GPH Stands for Gallons Per HOUR of water used. * GPM Stand for Gallons Per MINUTE of water used. Either choice is a winner! The Vapor Rino 145 is king in the both the 120 volt and 230 volt all electric dry vapor, commercial steam cleaner class. No matter which unit you get, you are getting the best of the best. Maximum PSI is exactly the same in both units. That said the units perform differently. The 230 V has over twice times the output of the 120V. We now have a converter available that lets you turn two 115V household outlets into 230 Volts instantly. See Instant 230 Volt Converter page. The "Magic" Box: Let’s talk about this converter for a moment. All the power of a 230 volt Rino off of two 115 Volt Outlets??? Our unique light weight converter essentially allows you to run our 230V Vapor Rino's on standard house hold 115 or 120 Volt outlets! Amazing but true. By plugging into two independent outlets you can combine one 115V outlet to another 115V outlet and get 230 Volts instantly. Our systems make having and using a HIGH POWERED STEAMER Easy. Learn more about our 230V converter and how it works on the converter page. See products menu. 230V = More than twice as powerful! The added power of the 230V system means it can handle a LONGER HOSE up to 26 feet long. The 230 volt system heats up close to 3 times faster than the 120V and has about 8 times faster recovery rate of a 120V! More below. A simple rule of thumb is this: If you have or can get a place to plug the 230-volt in, strongly consider getting the 230-volt Vapor Rino Vapor commercial Steam cleaner System. If you can arrange to have an outlet installed or if you have a strong enough generator (6000+ running watts) OR if you want to use our instant 230V dual cord device strongly consider getting the 230V version. If you can plug it in it is fantastic. Because of their raw power our 230V units are very popular among professional users. See the 230V Rino page for more information. The 230 Volt version is truly an amazing commercial vapor steam cleaner. Approaching three times the overall vapor steam cleaner output over the 120 Volt version, the 230V, 145 PSI Vapor system is sure to impress. If you have ever worked with an all-electric 120 volt vapor steam cleaner of ANY brand one of the first things you notice is that the pressure drops quickly during use. There is no way a 120 volt, all electric, vapor steam cleaner can keep up with steam production like a 230 volt can. It just can’t happen All 120V, all electric vapor steam cleaners on the market drop down in pressure during use. That doesn't mean they are not good machines, it simply means they just don’t have the same staying power. This is normal for any all electric 120V system. The all electric 230V generates more than TWICE the steam and can maintain approximately 100 PSI during normal use! That being said, as a contractor, I personally used a 120 volt vapor steam cleaner for years with great success. My first unit ever was the VC 4000-S commercial steam cleaner. Similar, yet smaller than our 4000-C system. It had 65 PSI and 1600 watts with a single tank. I loved it. The Vapor Rino VR145, VC 5000-Ci and our other 120 Volt systems are light years ahead of my beloved first steamer. Now that I have tasted the quality and power of a Vapor Rino, there is no going back to my old 65 PSI unit. At either 120V or 230V, the 145 PSI, chemical injected Vapor Rino's are fantastic, high quality machines. Quick Definition: I have 220V not 230V, what do I do? Great question. In the USA, there is a common voltage range that all means basically the same thing. Vapor Rino 230V can plug into outlets that range from 210V, 220V, 230V, 240 and even max 250 Volt outlets. Its a lot like standard household voltage most commonly called 120 Volts. This class typically ranges from 110 volts to 120+ volts. So, if you have access to, or can get access to a 240V outlet, 230V outlet or a 220V power source, no worries, you are good to go. • Warm up time is only about 15 minutes. • Recovery time is about 4 minutes. You can plug a 120 Volt Vapor Rino into any standard American outlet. So, if you're at your mom's house or at the office, no worries. Just plug it in, warm it up and get to work. There is no doubt that the 120 volt version is very convenient. Warm up time from ice cold to ready is about 15 minutes. The 120 Volt version will produce the same peek 145 PSI pressure as the 230 Volt version but it will not maintain as much steam or recover as fast. Recovery time on the 120V is about 4 minutes. Other than the power and steam generation difference, the machines have the same basic features, come with the same accessories, and are the same size and shape. • The 230 Volt 145 PSI Vapor Rino’s Warm up time is only about 5 minutes from ice cold!!! The 120v takes 15 min. The 230Volt Rino maintains around 90 to 100 PSI even after 5 minutes of wide open, heavy steaming! Let go of the trigger and about 30 to 60 seconds later you have full recovery to 145 PSI • Recovery time is super-fast, about 8 times the recovery rate of the 120 Volt system. The 230V system can handle (and comes with) a LONGER STEAM HOSE up to 26 feet long. There are really no cons to the 230 except one. So let's address that now. The only down side to a 230 Volt Version of the Vapor Rino Commercial Vapor Steam Cleaner is that you have to have access to a 230 Volt outlet. It's that simple. You can use a generator (see generator section) or your shops 230 volt outlet. You can also have an outlet installed at your location. Having an electrician install a single outlet is usually very inexpensive. You may also consider our instant 230Volt in home converter. See products page. See our generator info in the FAQ or Common Questions section of this page for more on picking a generator. Do Not use a underpowered generator. Make sure you pick the right size and it has the right outlet. 230 Volt PROS: Power, More Power and did we mention power? Oh yeah, and a maximum hose length of 26 feet! Yep, it is a simple choice if you have the ability to use it. 230 Volts is simply the best option if you want maximum steam generation power. Also, the heat up time from cold to hot is only about 5 minutes rather than 15 minutes, recovery rate is 30 to 60 seconds as opposed to 4 minutes with the 120 volt Vapor Rino. As you can see from those numbers, we are talking about at least 3 times the steam generation capabilities. Both units are great. For me, I like the 120 Volt version just because I can use it anywhere, anytime, running off of an everyday outlet. If I were in the mobile detail business, a cleaning contractor with a lot of jobs lined up or a carwash expecting to do a lot of work I would probably get the 230 Volt Vapor Rino commercial steam cleaner. It all depends upon my access to a 230 volt power source and how fast I need to get the job done. The choice is yours, both are cutting edge industry leading systems. The good news, unlike most systems on the market we give you a choice! Choice is power. Thanks for reading. Work Hard, Live Free! Dry CAR WASH & AUTO DETAILING -- is this a good machine for this? MOBILE DRY CAR WASH & AUTO DETAILING = YES! Absolutely! The Vapor Rino commercial steam cleaner is perfect for this kind of work! The mobile dry carwash industry is becoming very popular as more and more cities impose water restrictions. From its high power to its fully adjustable chemical and hot water injection system this machine is fantastic for this industry. Purchase a 230 Volt version and provide you and your customers a faster service. The 230 Volt version generates about three times as much steam per minute then the 120 Volt version. This means you can clean faster than ever before. The steam flow is 100% adjustable! This means you can easily lower the steam flow for delicate interior automotive detail work. Be it a exterior carwash, interior detailing, cleaning sticky gunk out of cup holders, around seat bolts, door jams or cleaning tires and engines. The Vapor Rino 145 PSI Chemical Injected high powered commercial vapor steam cleaner. TILE & GROUT: Is this a good system for cleaning Tile & Grout? Absolutely! The Vapor Rino commercial steam cleaner is an excellent TILE and GROUT cleaner. In most instances it does an amazing job clearing floor grout and mopping all kinds of hard surface floors. 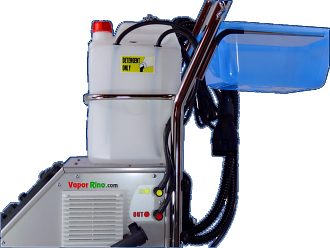 The Vapor Rino is a great all around cleaning service vapor steam cleaner. Years ago I ran a bathroom renewal company. One of our services was cleaning residential and commercial floor grout. Using the grout brush and the extension poles (included) we would work the grout lines and in most cases, the floor was restored to close to new. For smaller jobs we charged by the job but in most cases we charged by the square foot. Back when I was doing it we were charging $2 a square foot. You will have to call around and get an idea on price in your local market. Unlike the expensive truck mount tile and grout cleaning machines a Vapor Rino costs less and is MUCH more flexible. Try running a truck mount hose up to the 4th floor of a home or building. It's just not going to happen. On the other hand, you can take one of Vapor Rino's commercial vapor steam cleaners anywhere. 40th floor? no problem. Just bring it up and plug it in. 100% portable and effective! FREE SHIPPING: How Long Dose It Take To Ship? We offer free shipping on most of our Dry Vapor Steam Cleaners within the lower 48 continuous states. Shipping most often takes from 5 to 7 Business days in the lower 48 US States. Free Shipping, some exceptions may apply! Shipping time is based on when the item leaves the warehouse, not the time the order is placed. Most items are processed, quality control tested and ship out within 24 to 48 hours excluding weekends and holidays. Shipping time is based upon when the item leaves the warehouse. Most items ship UPS. FREE Shipping is not available on all systems. See product page to see it that items offers free shipping. Express shipping is never free and not available on larger units. Does this come in a dual hose format? No sorry, none of our DRY vapor steam cleaners offer dual hoses. HOWEVER, if you compare our prices to a two-hose system in most cases you can buy two of our units for the price of one of theirs. Wow, two industrial grade units, twice the dependability and more flexibility in use for close to the same price? YES, enter Vapor Rino! Our hoses are detachable and replaceable. The 120Volt system comes with an approximately 12-foot hose and the 230-Volt system come with a huge 26-foot-long main steam hose. This system works with one hose at a time. HEATING TIME: How long does the 120 Volt version take to heat up? Typically around 5 to 6 minutes for our 230 Volt version. Dry Steam -- Wet Steam? What is the difference? Dry Steam – High Volume Wet Steam? What is the difference? * Unit weight typically under 55 lbs. * A High Volume WET Steam cleaner uses a about 1 Gallon per MINUTE! or 70 Gallons per hour. * Unit weight vary but from 350 to 500 lbs. * Wet Steam is mostly for outdoor use only or in places with a floor drain. Check out our "Why Wet Steam" and "Why Dry Steam" sections for more information. What if I need Repair in the future? If your dry vapor steam cleaner breaks down or is damaged simply give us a call. We will direct you to the nearest service center. Our light weight compact designs make it simple to box up your unit and get in for repair. Be sure to get a tracking number and let us know it’s coming. Please CALL FIRST, in many cases, we can resolve an issue quickly by phone. In most cases the end user simply sends the unit in to the service center. Once sent in to the service center it is repaired and sent back to the user. The process is simple and easy. Never fear, our team can get you back up and running! * ONE Year parts and labor. * LIMITED LIFETIME warranty is granted for the Boiler. * THREE Years on parts from date of sale. The sole and exclusive remedy under this warranty is repair or replacement at the manufacturers option, of any product that proves to be defective in manufacture or materials within the above stated period. There will be NO cash refunds on equipment that has been used. For this warranty to apply, the owner must follow the instructions provided in this manual completely. * A copy of the original invoice must accompany the unit when it is returned for service, together with a note explaining the problem. * It must be shipped, in a protective carton, preferable in the original box if possible. * The manufacturer recommends that the shipment be insured against loss or damage in transit. The manufacturer, or dealer is not responsible for damage of this kind. Certain parts of the equipment are not covered by warranty because they require in the course of use, due to normal wear and tear, by reason of their characteristics. These are things like cords, hoses, switches, brushes, wheel ect..
1. Damage results from accident, misuse, fire, act of god, improper operating, use of voltage other than indicated in this manual, substances other than clean water are used in boiler, or unauthorized repair or alterations. 2. The product has been used with any substance other than clean tap water. Purified water is recommended. 3. The product has been used by an unauthorized person. 4. The product has been opened or serviced by the end user without prior written permission. Opening the machine will void the warranty. The manufacturer is not liable for any consequential or incidental damage, including personal injury, property damage, or monetary loss that may be incurred from purchase, use, or improper use of the product. Maximum liability shall not exceed the purchase price of the product, paid by the original purchaser. All expressed and implied warranties for this product, including implied warranties of merchantability and fitness for a particular purpose, are limited in duration to the warranty period, and no warranties, expressed or implied, will apply the warranty period. Some states do not allow the exclusion or limitation or consequential damages, so the above exclusion ma not apply to you. This warranty gives you special rights which may vary from State to State. The factory (manufacturer) does not authorize any party to assume any other warranty obligation with the sale of this product. The Manufacturer is TPA Impex. For service please call your dealer. Just Renew it LLC nor Vapor Rino are the warranty holder for this product. We will be happy to point you in the right direction for service.